He studied at the School of Art and Design and RSA life classes, following which he went to Antwerp and studied at Verlat. 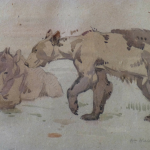 Greatly interested in animal painting he found his subjects in the zoos of Antwerp and London. He later played an enthusiastic part in the formation of Edinburgh Zoo. He painted a few figure paintings, portraits and landscapes in the Highlands and Glens. A respected and popular teacher, he was also a contributor to the Evergreen and a regular contributor in exhibitions at home and abroad.